Lac du Flambeau - Coming Soon! New Listing on High Lake! Pet Friendly! BOOK your Pontoon Rental for 2019! 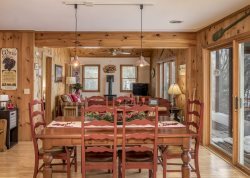 Experience all the Northwoods has to offer in this super cozy and newly remodeled cottage located on beautiful High Lake in Land O’ Lakes, Wisconsin! This 2 bedroom, 1 bath cottage offers plenty of space for 5 guests. Don’t forget your furry friend at this pet friendly home! The fully stocked kitchen is perfect for eating in for a family meal or preparing sandwiches and snacks for a day on the lake. Gather around the fireplace for cozy conversation or to unwind with a good book. WiFi internet and smart tv offer you modern options to stay in touch! The Cottage on High Lake is ideally situated at the gateway to year-round outdoor adventure - whether it’s on the water, land, or snow. The cottage features lake front access with level frontage and a private dock. From the dock you can use one of the two kayaks, canoe, or row boat to explore the 1100 acre High Lake-Fishtrap chain and the 230,000 acre Northern Highland-American Legion State Forest that protects much of the lakes’ shoreline. The High Lake chain is home to some of the best fishing in the Northwoods and a new fish house is ready and waiting for you to clean your day’s catch. High Lake is also the starting point for the Manitowish River 44 mile canoe route. Once you’re back on dry land you can trade in your fishing pole and paddle for a bicycle and backpack. The 52 mile Heart of Vilas County paved bike trail is just 5 miles away. Interested in hiking instead? With the Ottawa National Forest only minutes north of you, the Chequamegon-Nicolet National Forest just a few towns over to your east, and the Northern Highland-American Legion State Forest all around you, the hiking options are limitless! Your adventure does not have to end when the water freezes and trails get covered with snow. There are more than 30 cross country ski sites, with more than 500 kilometers of trails, within 50 miles of the cottage. Whether you are looking for a meticulously groomed trail, or you want to set your own tracks through a fresh layer of snow amongst towering pines or old growth hemlocks, your trail is waiting nearby. In addition to skiing, many of the local trails allow snow shoeing (feel free to use the 2 pairs of snow shoes at the cottage if you didn’t pack yours) and fat tire biking. Access to the snowmobile trail is right out your back door. At the end of the day create lasting memories under the stars around the fire pit or playing board games in the 3-season porch. With gorgeous lake views, the Cottage on High Lake is the perfect vacation destination for your next getaway Up North. Don't forget to book your Pontoon rental with us! Click here to rent! ** Home and Boat discount - Rent together receive fee delivery! Check out our Special page! 2 Pairs of Snow Shoes - 25" & 30"
JULIE AND HEATHER ARE VERY DETAIL ORIENTED GREAT!! CUTE AND COZY COTTAGE ENJOYED OUR STAY! EXCELLENT!! HAVE RENTED SEVERAL TIME AND ARE HAPPY WITH THE HOMES AND THE SEVICE.THE COTTAGE IS VERY COZY BUT ON THE SMALL SIDE. PERFECT FOR A COUPLES GET AWAY. Thanks for your honest feedback! See you again! Northwoods Home Rentals. Great time! We will definitely be coming back! We loved our stay! It was a great perk to have WiFi. Very pleasant, professional. Appreciate the option given to me by Julie to move my reservation to a different time and cabin when the lakes remained frozen for the fishing season opener in May. Excellent response time and efficient booking and correspondence. I would change out the sleeper sofa, uncomfortable to sit on. We had a rainy day so we were inside one day and needed the sofa to sit on. What was your reason for visiting and what activities did you enjoy in while visiting? (ex. fishing, snowmobiling, skiing) Canoeing and wildlife watching. Very easy website to use, property was as advertised. Nice cottage, clean, and comfortable. Septic alarm went off late at night. Ended up leaving the following night instead of waiting for till the morning. Very well decorated and clean. Received follow-up phone calls / e-mails right away! Heather was wonderful. LOVE the remodel. Super cute cottage!! Favorite ... the porch!!!!!!!! !First experience, of this kind, for us! All went off without a hitch! Heather and Julie were very helpful and responsive. Great team to work with. It was so nice to work directly with the Northwoods team. They took you call or email and were very responsive and helpful. The Cottage on High Lake was outstanding. Nicely renovated. Very clean. Great view of the lake and the Bald Eagles and Loons. High Lake is a 741 acre lake located in Vilas County. It has a maximum depth of 36 feet. Visitors have access to the lake from a public boat landing. Fish include Musky, Panfish, Largemouth Bass, Smallmouth Bass, Northern Pike and Walleye. The lake's water is moderately clear. Check Out Information about High Lake! Fishtrap Lake is a 339 acre lake located in Vilas County. It has a maximum depth of 34 feet. Fish include Musky, Panfish, Largemouth Bass, Smallmouth Bass, Northern Pike and Walleye. The lake's water is moderately clear. Check out Fishtrap Lake! The Manitowish River starts at High Lake. As the river flows gently west through Vilas County it joins the Bear River to form the North Branch of the Flambeau River. This 44 mile stretch of river is a designated canoe route ( NHAL Canoe Route ) and offers approximately 40 canoe campsites. The Sylvania Wilderness is a beautiful 18,000 acre forest preserve that feels like a smaller version of the Boundary Waters. Old-growth forests and crystal clear lakes dominate the landscape. This primitive wilderness is a great place to enjoy a day of fishing, paddling, and solitude. Check out more information about the Sylvania Wilderness!